The beads made by Winston, a vast collection of czech glassbeads and beads from all kinds of materials are put together into custom made jewelry by Ruth Neeb-Doull since the early ninties. In the Perlenatelier am Rathaus she sells the jewelry just as well as the glassbeads and jewellery findings. 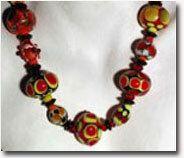 She shares her experience of jewellery making in courses.